I had some fondant left over from my Christmas cake of which I made little Santa’s hats 🙂 This would be great to set on top of cupcakes which have been iced or even on cakes. As I already had baked so much cake this Christmas, everyone just got one on his/her plate as a decoration and also of course for eating. 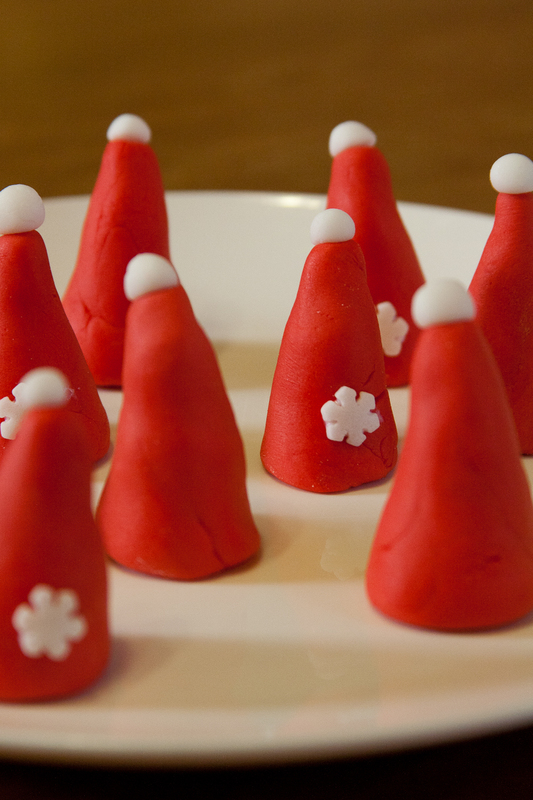 They are really easy to make, just dust your hands with some icing sugar so you wont stick to them and roll the red fondant in your hands until you get a hat-shaped form. Form small balls our of white fondant and stick them on top of the hat by gluing them together with a bit of water. But be careful not to use too much water, otherwise it will not hold and fall of. Too much water can ruin your fondant. In the end you could decorate them even further by applying little snow flakes or stars on to them, whatever you like!